I haven’t eaten a mammal since last August. So Mrs. C and I thought we would try an impossible burger. There’s a Wahlburger’s fairly close to my house so we went there. The verdict… It tastes pretty good. A someone who has eaten a lot of steak and burgers in their lifetime, it’s nowhere close to the best burger I ever had. It has a smokey flavor to it which was a bit too much. But for a plant based meat substitute, it was really pretty good. 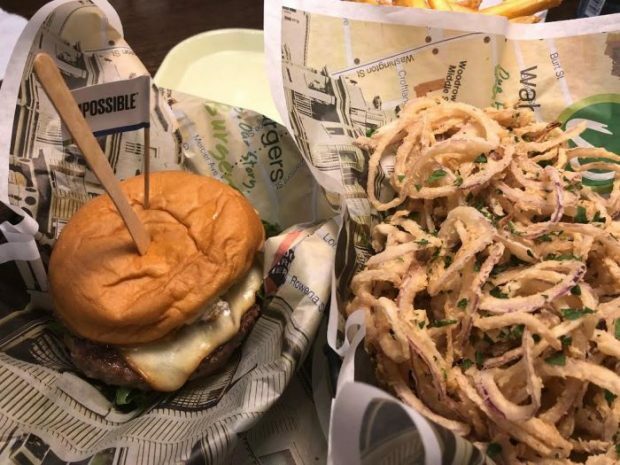 That being said, my stomach feels terrible now (an hour after eating), but I’m not sure if it’s the burger or the pile of onion rings I ordered as a side. Probably both. My body hasn’t had that level of grease in a long time. This may be a long night.